FOLLOW US ON FACEBOOK FOR UPDATED U-PICK & FRUIT MARKET HOURS! With over 32 acres of apples, plus our local pears and plums pushing us over 50 acres, Arlington Orchards are PEI's largest orchard. We also believe we're home to the best apple you'll ever have since all our varieties are grown to their perfect ripened flavour profile! 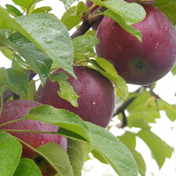 And with over 27 different apple varieties, there's a favourite apple for everyone in our PEI orchards. We currently have over 6,000 apple trees and we produce between 500-700 pound bins for a total of approximately 360,000 pounds each season. Half of those apples are currently exported, while the remainder are sold through our U-Pick, Fruit Markets, to other venues and restaurants. 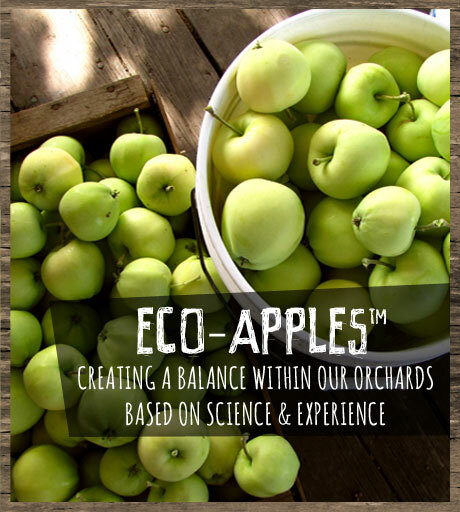 We are also home to Eco-Apples™, fun family or culinary events, and believe that "local" is based on taste. We also have Fruit Markets in Miscouche and Charlottetown— just look for the bright yellow buildings! Each week, we introduce a new variety of apple that's perfectly ripened and bursting with flavour. We also carry in-season PEI vegetables, plus jams, ciders and other tasty treats. Our staff are also trained apple experts, and can help you pick the best apple variety for cooking, eating, preserving or just for experimenting! Visit us on Facebook for updated hours of operation. 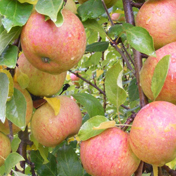 We specialize in apples of 27 current different varieties, all grown in the accredited, environmentally friendly method that creates our Eco-Apple™. 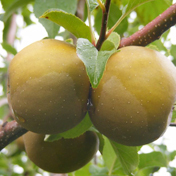 We also grow several varieties of pears and several varieties of plums, all of which are grown and nurtured to their ultimate ripeness and flavour. During harvest season, there's a new variety ready to go to market every week or 10 days! Ask for samples when visiting our U-Pick or our two Fruit Markets as you never know what your new favourite variety might be. Fruit can be large with thick, tough, greenish skin, mostly covered with red & carmine stripes and splashes. The white flesh is firm, coarse, and crisp. A rare combination of a great eating apple & perhaps the best cooking apple in the world today. There is nothing that can't be done to a Cortland! Also, slow to brown making it a good choice in a salad. One of the truly great fresh eating dessert apples. 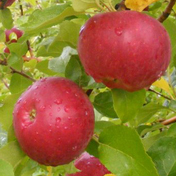 A rich, full flavoured apple with a pleasing aroma. Cream coloured flesh is fine-grained, firm and juicy. What can we say? Have you ever seen or tasted a more beautiful jelly than what is made from Dolgos. 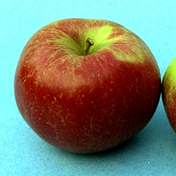 Here is a winner that originated in New Zealand Gala Apples on PEI. They run a little smaller but pack that sweet flavour that Gala lovers crave. Juicy & sweet, an eating experience! 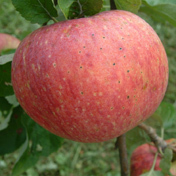 This rustic apple is pale green flushed almost overall with dark, dull red. Its fine flesh is juicy, slightly tart & moderately sweet. It has a particularly sharp taste early in the season. For a little apple it sure punches a sweet taste. Those that know it will have no other. Great for eating. Firm, crisp and juicy. Usually large & mostly red. 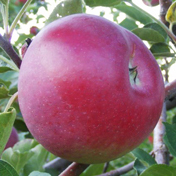 Distinctive flavour when fully ripe. Excellent for both eating & cooking. 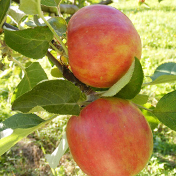 PEI is one of the perfect growing areas for Honey Crisp. 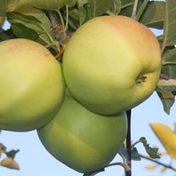 The explosive flavour & unique texture, makes this variety one of the most sought after apples today. Red blush over a yellow background. Bruises easily. Flesh is soft, juicy & good for eating. Also good for pies. Many confuse this as a McIntosh which it is not. It is, however, reminiscent of McIntosh & for those who can't wait for Macs, this makes an excellent choice. Juicy, firm, crisp, usually large apple. Becomes quite sweet if allowed to ripen several weeks after picking. Very good for cooking and eating. Stores well. Light green splashed with red streaks on the sunny side. Fine grained, crisp, juicy, & slightly tart. Does not keep well. Used mostly for cooking. 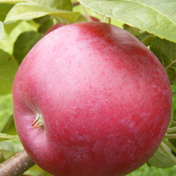 A pretty red apple with crisp juiciness and a pleasant, mild aroma, this apple tastes as good as it looks! 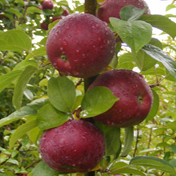 It is an eating apple, rating among the best for texture, flavour and storage time. 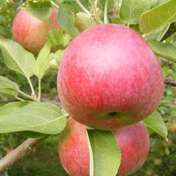 McIntosh type apple - great for eating & cooking. Big & red, the perfect apple for a display. 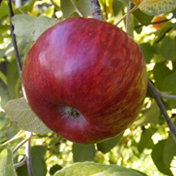 A much sought after & hugely prized apple in New England. Very flavourful apple, great for eating. A Mac, when it's ripe, is a perfect balance of sweet & tart surrounded by juice! If you have not experienced this you have not had a ripe Mac - you should try one now! 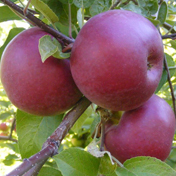 Very soft fleshed apple that bruises very easily, however, when ripe possesses an exquisite taste. Also great for cooking. Anyone who likes a Cortland will love Paula Red as it has all of the Cortland's attributes & ripens much earlier. Great for eating & outstanding for cooking. An Island favourite for a very long time. 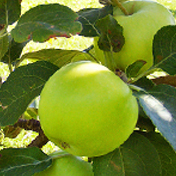 Every old farm orchard used to have one of these good for eating & highly prized for apple sauce. 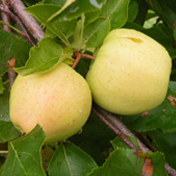 Absolutely delicious as an eating apple & also good in cooking, in salads (it�s slow to brown after being cut up) as well as in apple cider. 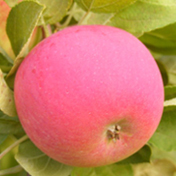 Aromatic, juicy and crisp, this flavourful apple delivers a hint of raspberries. A sweet apple that just gets better with age. 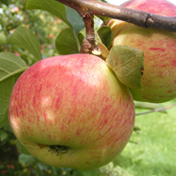 A versatile apple, great to eat & good for culinary use. 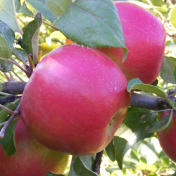 A flavourful, firm apple for eating and the number one choice for candy apples. 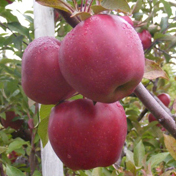 The Summer Red is similar in taste and texture to the Red Delicious. It is very juicy & firm. 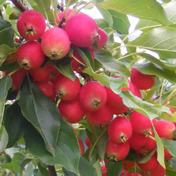 It is great for eating fresh & makes excellent apple sauce. 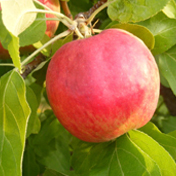 An excellent early season apple that has a unique taste when ripe. Enjoy eating it. 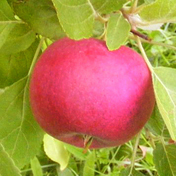 An apple that has been eaten enjoyed by Islanders since the 1840s. 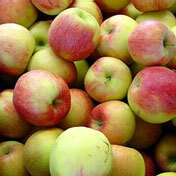 Also known on PEI as August Apples, they make a fabulous applesauce & pies. Arlington Orchards is a family run farm, with Carol and Barry Balsom celebrating their 20th year of growing apples in 2013. The land where our orchards now grow has been used for PEI agriculture since the 1820s, with Carol having grown on this very same land. It was in 1992 that Carol and Barry decided to focus on growing the best apples possible. Our first trees were the McIntosh and Cortland, and we started with just a 1/2 acre. 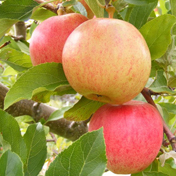 Since then, we have grown over 40 different varieties, and each year since then we have added other apple varieties, or have tried out new rootstocks on which to grow the varieties. As much as the flavors of our apples are a result of how we farm, we also must thank Mother Nature and her love of Arlington, PEI. Arlington is a small community in western Prince Edward Island. Thanks to natural barriers and a consistent off-shore breeze from neighboring Malpeque Bay, this area has a more consistent temperature compared to other areas of the Island. This provides a warmer home for our apples in the summer, and a less harsh environment for the winter months. The ice in the spring even keeps the apples cool so they don't blossom too early. 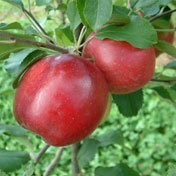 As well, there are 15 different types of our rich, red Island soil but only 2 of them are ideal for growing apples. 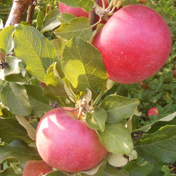 Arlington happens to be one area which has this apple-friendly soil which also allows the trees to get lots of moisture and nutrients from the tree's deep root system.